VR Zone has photos and specifications of the ASUS Rampage IV Gene, an upcoming Micro-ATX motherboard based on the Intel X79 chipset. You can check it out over here. The Rampage IV Gene is a micro-ATX form-factor motherboard based on the Intel X79 chipset, supporting Core i7 processors in the LGA2011 package. It aims to give you everything the X79 platform can, 3-way SLI and CrossfireX included. 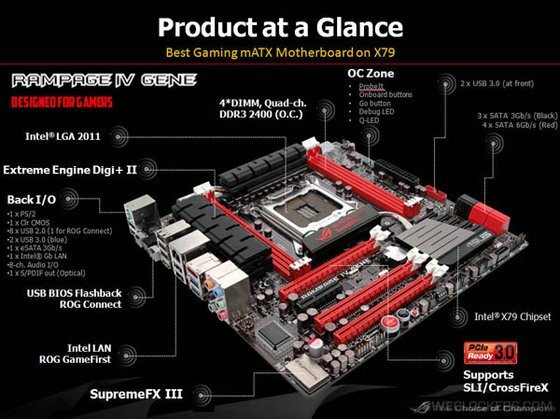 The top half of the board is laid out like any other X79 motherboard. The LGA2011 socket sits in between two sets of DDR3 DIMM slots with two slots each, supporting quad-channel DDR3 memory, with speeds of up to DDR3-2400 MHz by overclocking.